I hope you liked my Toronto post on Monday! I know I love reading travel content and we had so much fun on the trip that I was really excited to share it. Today I have just one more thing to share about our trip to Toronto and it’s a fun thing I got to do for myself while we were there! In planning such a busy trip, I knew my “get ready” time was going to be pretty limited – so I called in a little bit of help from beGlammed. I found beGlammed on Instagram and immediately thought that this was a traveling mom’s best friend. Someone was going to come to our hotel room and do my hair and makeup while the kids had snacks and played? Sign me up! We were busy and casual for most of the trip, so I scheduled my beGlammed appointment for the morning after we got back from Niagara Falls (when I knew I’d probably need it most! ), right before we went to brunch at Ricarda’s. The brunch was almost like a little date for us, since the boys were at the kids’ brunch, so it felt like a good time to get a little glammed up! My stylists, Nicole and Suzanne, arrived at the hotel at 9 and worked on my hair and makeup at the same time in our hotel bathroom (which was, thankfully, pretty spacious!). For makeup, I wanted something neutral but a bit more elevated with some lashes. For my hair, I really just told her what we were doing and that I wanted it to last for a few days (and I got like 4 days out of it, which is amazing!). Meanwhile, the boys were hanging out in the room with their pre-brunch doughnuts and a movie. They popped in a couple of times to “check in” as they often do and said hi to the ladies. It was a super relaxing and fun experience and I felt like I actually got to take a few minutes for myself amid the crazy fun of our family vacation. I also felt like I packed a little bit less in the way of makeup and hair stuff because I knew that I had this scheduled and it would be a little refresh during the trip. 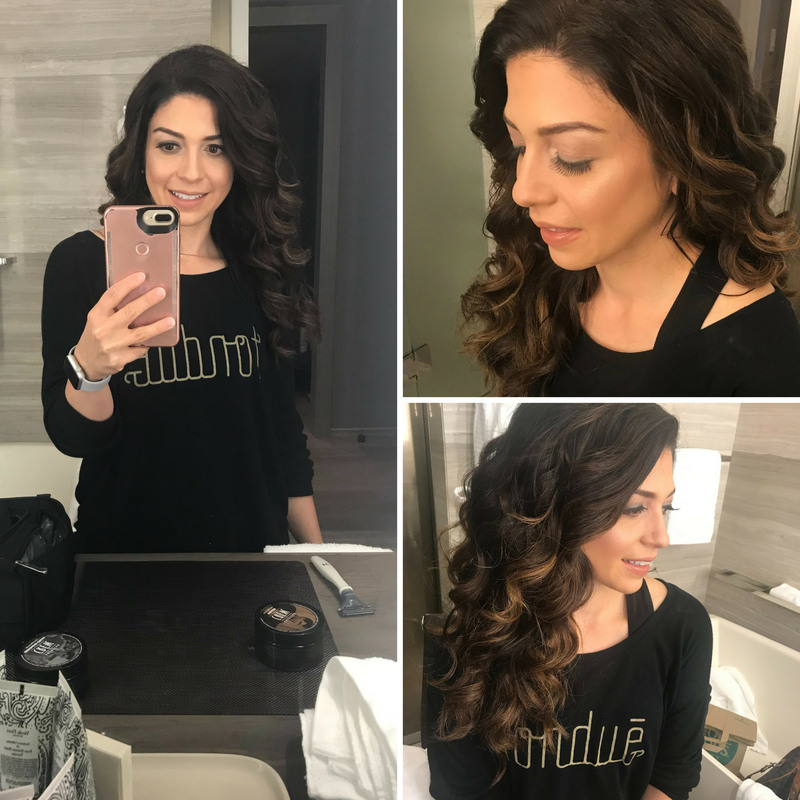 So, beGlammed is actually all over the US (I had a friend already tell me she used it in Orlando and had a great experience! ), and you can book for hair, makeup and nails (or a combination of any of those) for an event, weddings or just because! It’s super easy to book on their website, and my stylists confirmed with me via text message, so coordinating everything was simple too. beGlammed is offering the HSS feed readers $20 off your first appointment with them when you use the code HSS. If you book an appointment, definitely let me know how it goes! I hope you love it as much as I did! Thanks to beGlammed for treating me to this amazing service in Toronto!